Please check out these articles about the show! D.C.-based photographer, Mickey Leon Armstrong is shaking up the city with his mission to stomp out the weight-conscious and discriminatory fashion industry by promoting SELF-ESTEEM and EMPOWERMENT among full-figured women with The Curves Ahead Project! Mickey and his team have partnered with independent designers and fashion retailers to bring a brand new fashion experience to D.C., showcasing full-figured women and fashions on the catwalk! District of Curves is all about celebrating fashion, not hiding shapes; leaving women feeling confident and chic. Join the movement! 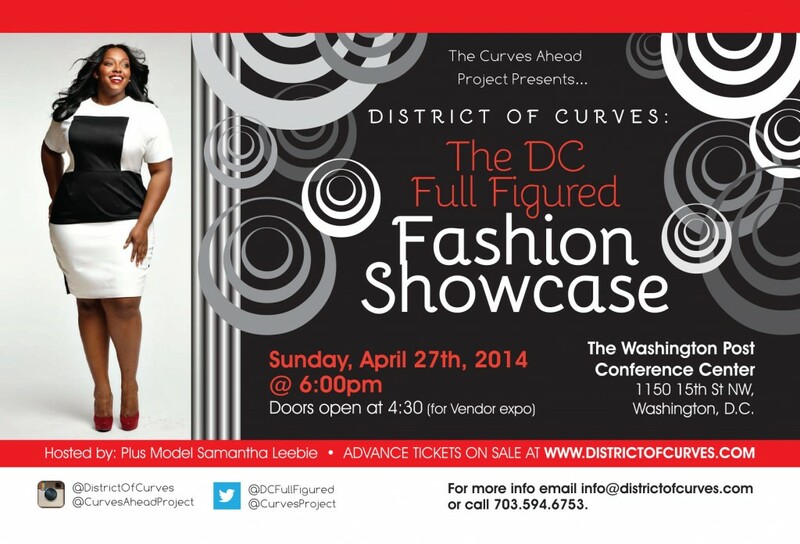 Come out and show your support for ALL self-proclaimed “curvies” at the DISTRICT OF CURVES FASHION SHOWCASE being held THIS Sunday, April 27from 6pm-9pm (doors open at 4:30pm) at the Washington Post Conference Center (1150 15th St NW, WDC). Visit The District Insider to view this original write-up. The author is Richeen Ariel, Editor of The District Insider. Washington, DC (April 27th 2014) – Who would have thought that the fashion industry would have come this far? To be able to walk into major department stores and witness increasing options for the curvy woman is poignantly inspiring! And, the full-figured fashion industry continues to grow by leaps and bounds. So, who do we credit? Well, … giving credit where it is due would mean starting with strong and confident women, of all shapes and sizes, as well as their supporters. After all, it takes a village, n’est-ce pas? A village of socially aware individuals that never take “No!” for an answer. All while blazing trails for the brands and icons that are emerging today. The Curves Ahead Project is dedicated to keeping the momentum. Let’s continue to shine! To those of you looking off into the distance for the next occasion to join the movement, look no further! DISTRICT OF CURVES: The DC Full Figured Fashion Showcase is an opportunity for self-proclaimed “Curvies,” and the lovers of their sensual curves, to come out and show support. At 6pm on Sunday, April 27th, the Washington Post Conference Center will be the perfect setting for a showcase of fashion designers, boutiques, and gorgeous “Curvies.” Located inside the historic Washington Post building at 1150 15th Street NW, this Washington D.C. venue is both significant and elegant. District Of Curves, Washington, DC’s Full Figured Fashion Showcase, proudly features the following retailers Brett's Trove, The Unique Girl Boutique, Pop Up Plus NY, Jon Marc of Seven Curves, Real Divas Are Large, Crystal’s Bridal, Fashion To Figure (Wheaton Mall), IGIGI by Yuliya Raquel, Ashley Stewart (Alabama Ave), and Juul Couture. A stylish showcase with a major following, DISTRICT OF CURVES is an extension of The Curves Ahead Project’s mission to promote self-esteem, positive body image, and assertiveness. The Curves Ahead Project was created by Mickey Armstrong of M.Armstrong Photography. It is a project that is centered on Full figured women, Full figured fashion, and the stories, anecdotes, struggles, and journey of many everyday Full figured women. It features models, business owners, and other important figures in the Full figured fashion community. The Curves Ahead Project is a glimpse of the Full figured community from a photographer’s lens. The development and production of the project are delivered by contributions from donors, partners and sponsors. The Curves Ahead Project is truly a product of devotion! We invite you to become a part of this showcase. To contribute, log onto www.TheCurvesAheadProject.com and stay tuned for important announcements and giveaways! DISTRICT OF CURVES event tickets and VIP options are now available online at www.DistrictOfCurves.com! Fashion designers and clothing lines wishing to be featured during DISTRICT OF CURVES: The DC Full Figured Fashion Showcase, email info@DistrictOfCurves.com. Stylists, Makeup Artists, and volunteers are also invited to contact the project directly to become a part of #DISTRICTOFCURVES. For sponsorship inquiries, media requests, or press entry, contact LaDàna Drigo at info@AbovePrestigePR.com.